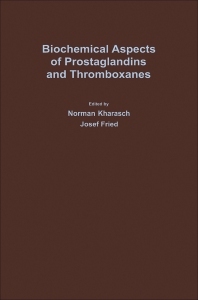 Biochemical Aspects of Prostaglandins and Thromboxanes covers the proceedings of the 1976 Intra-Science Research Foundation Symposium on New Biochemistry of Prostaglandins and Thromboxanes, held in Santa Monica, California. This 14-chapter book deals first with the biosynthesis of prostaglandins and thromboxanes with bovine vesicular gland and in transformed fibroblasts. These topics are followed by discussions on the pharmacologic properties and the role of prostaglandins as mediators of the inflammatory response. The next chapters describe the structure-activity relations and the pharmacologic activities of the prostaglandin series, with an emphasis on their role in cancer, obstetrics, and gynecology. The remaining chapters examine the role of prostaglandin endoperoxides and thromboxanes as bioregulators. This book will be of value to biochemists and pharmacologists.